A team of researchers has found that traffic noise reduces the foraging efficiency of wild owls by up to 89 percent. The team's world-first study examined how different levels of such noise affect the hunting efficiency of these nocturnal predators, which employ a keen auditory sense to locate prey in the darkness. As transportation networks rapidly develop around the world, concerns have been heightening over the adverse effects of traffic noise on wild animals, particularly "acoustic predators," which depend on their acute sense of hearing to catch prey. However, as it is difficult to observe wild owls' nighttime foraging activities, the hypothesis that traffic noise reduces the hunting efficiency of acoustic predators was unsubstantiated prior to this study. The team of researchers from Hokkaido University's Graduate School of Agriculture, the Forestry and Forest Products Research Institute, and California Polytechnic State University developed an artificial prey rustling sound to attract owls and thus facilitate observation of the birds' nighttime hunting pursuits. From December 2014 to March 2015, the team conducted experiments at 103 locations in Yufutsu Plain in Hokkaido and Sendai Plain in Miyagi Prefecture—both in northern Japan—where owls overwinter. 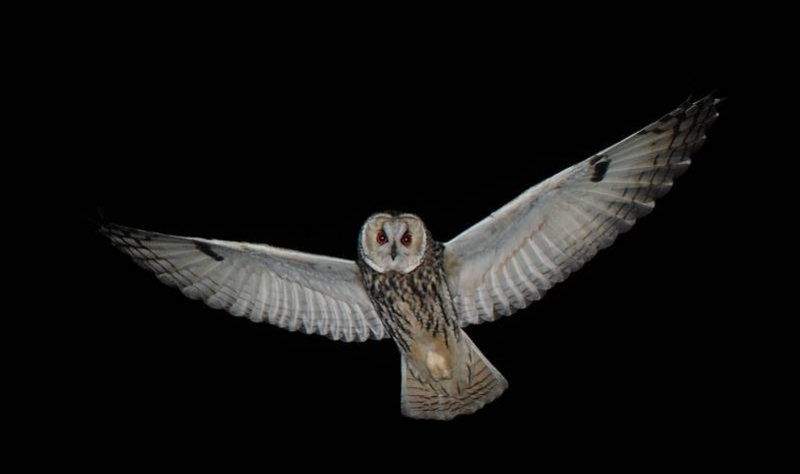 In the experiments, researchers scrutinized the foraging activities of 78 owls (45 short-eared owls and 33 long-eared owls) while playing back different levels of recorded traffic noise and a constant level of an artificial prey rustling sound. The experiments showed that the rate of owls detecting the artificial sound reduced by 17 percent even at the lowest traffic noise level of 40dB (equivalent to the noise level of a quiet residential area), while the rate dropped by 89 percent at the highest noise level of 80dB (similar to the noise level inside a train). The team estimates that the effects of traffic noise on owls' ability to detect prey extends as far as 120 meters from a road, which is farther than previously thought. A previous study using captive bats showed that their foraging activities were affected at a range of about 50 meters from a road. "Behavioral changes in acoustic predators can alter the interactions between prey and predators, and possibly have negative consequences on the entire ecosystem," said Futoshi Nakamura, one of the coauthors at Hokkaido University. "It is necessary to unravel the mechanisms behind this reduced foraging efficiency, as well as possible resultant drops in survival rates and changes in distribution, in order to develop measures to lessen the impact of traffic noise on acoustic predators."